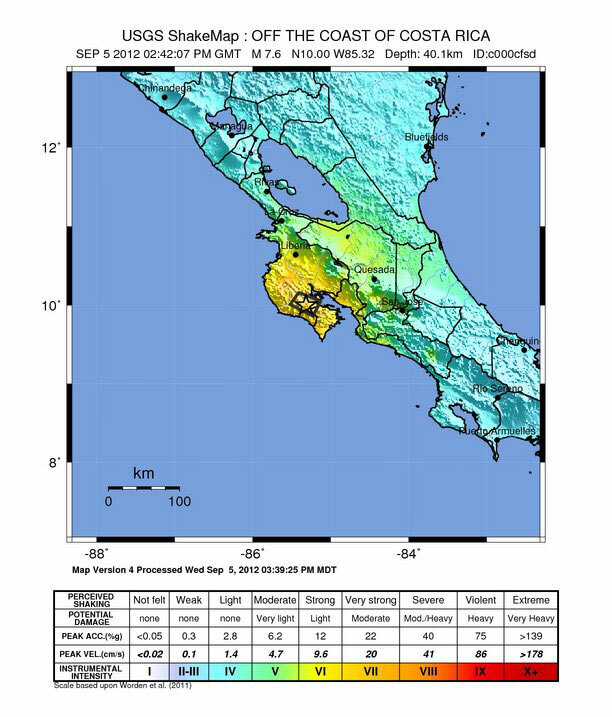 On Wednesday, September 5, 2012, at 14:42:07 UTC, a magnitude 7.6 earthquake struck roughly 40 km (25 miles) below the surface of the Earth, 10 km (6.2 miles) ESE of the city of Nicoya, Costa Rica. 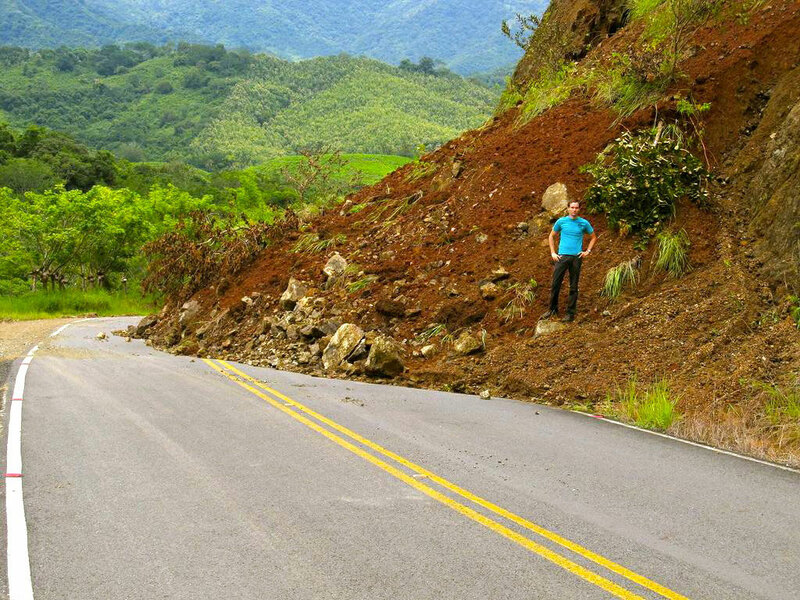 This earthquake occurred beneath the Nicoya Peninsula of Costa Rica as the result of thrust faulting on the subduction zone interface between the subducting Cocos and overriding Caribbean plates. 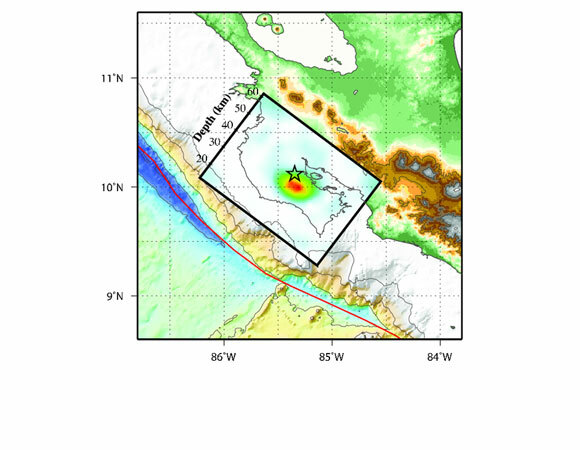 At this latitude, the Cocos plate moves north-northeast with respect to the Caribbean plate at approximately 77 mm/yr, and subducts beneath Central America at the Middle America Trench, as determined by GPS observations supported by UNAVCO. 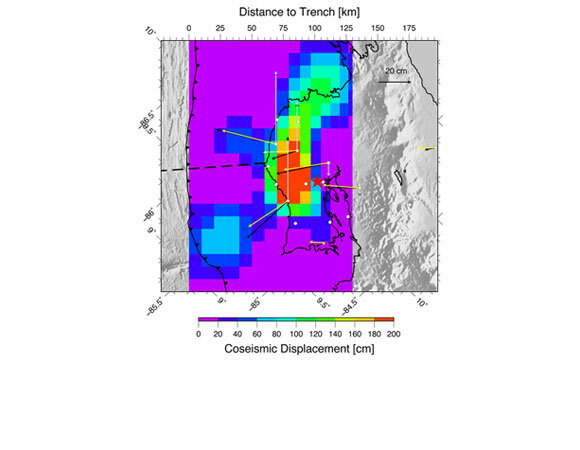 Preliminary estimates show that approximately 3 meters of slip occurred on the interface between the two plates. 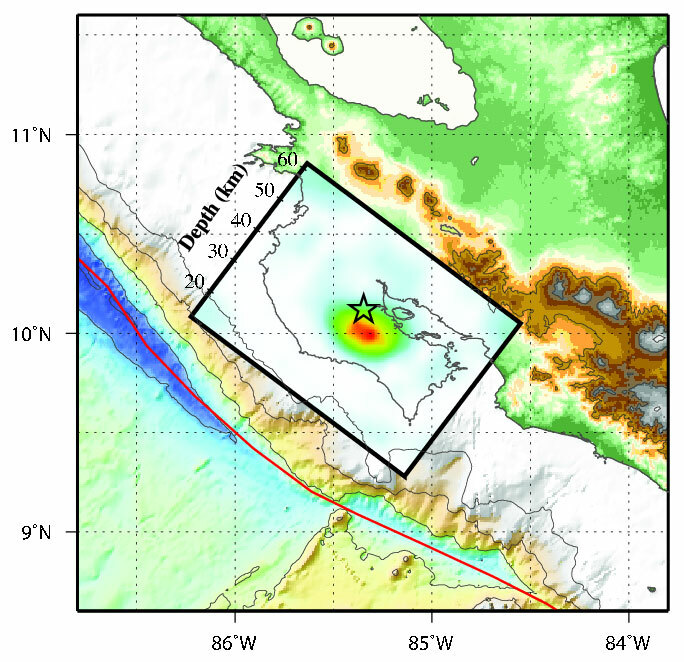 The Nicoya peninsula last experienced an earthquake of similar magnitude (M7.7) in 1950, and an event of similar size has been expected for the past several years (e.g. Feng et al, 2012). In collaboration with OVISCORI, the Costa RIcan National Volcanic and Seismic Observatory the UNAVCO community has invested many resources to build multiple continuously operating GPS stations that adequately instrument the Nicoya Pennisula where the earthquake occurred. 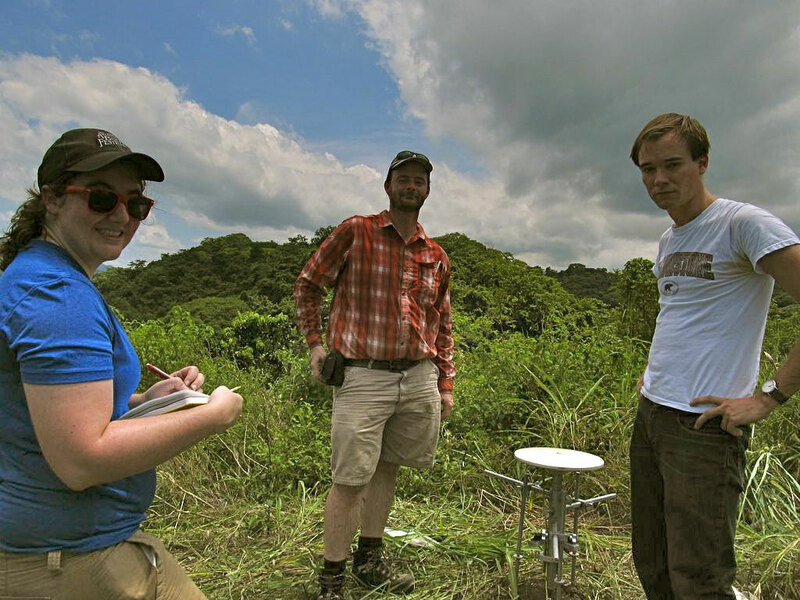 The network was upgraded by UNAVCO and OVSICORI staff in January 2012, and three weeks before the M7.6 earthquake was featured in the article "Sensors in place to measure next big Nicoya quake". 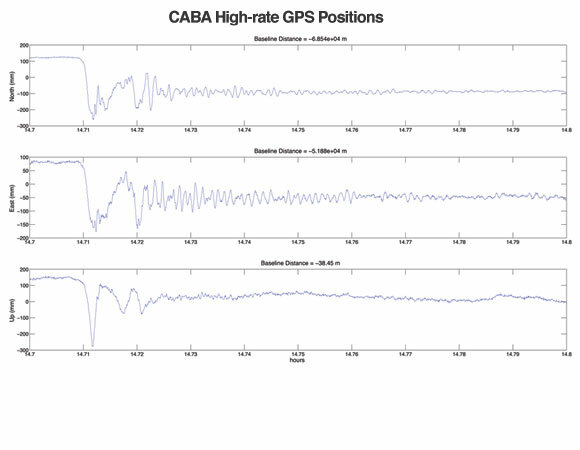 GPS observations have also shown that the Nicoya peninsula is subject to Episodic Tremor and Slip (ETS) events (Outerbridge et al, 2010). The May, 2007 ETS event involved approximately 2 cm. of slip on the plate-bounding fault that appears to have slipped on September 5th. 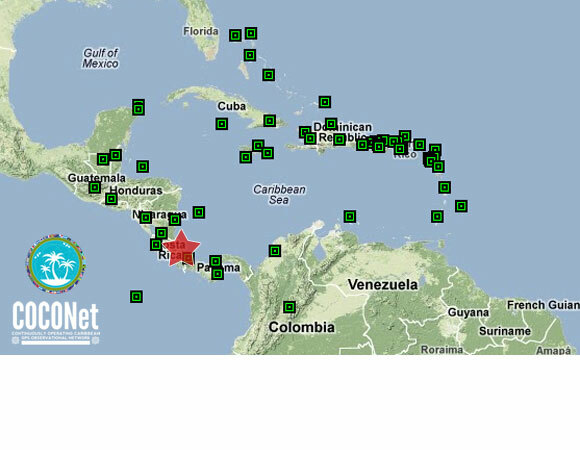 View more details about this earthquake at USGS Event Page. For detailed information we recommend this excellent presentation: MARGINS 2009 Presentation on Nicoya GPS, Earthquakes, and ETS by Prof. Tim Dixon of the University of South Florida. 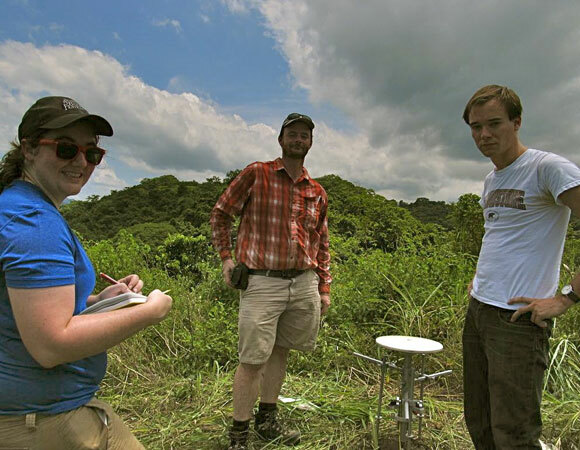 Over the past two decades, the UNAVCO community has invested many resources to build multiple continuously operating GPS stations that adequately instrument the Nicoya Pennisula where the earthquake occurred. Figure 1. 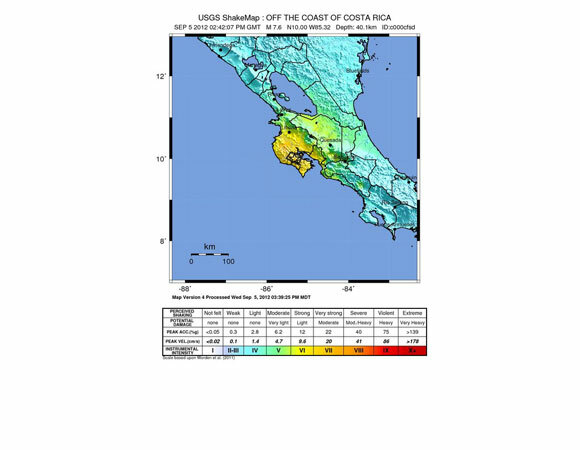 This is a shakemap that shows the ground shaking produced by the Sept. 5, 2012, earthquake off Costa Rica produced by the USGS. Read more about shakemaps here. Figure 3. Surface projection of the slip distribution superimposed on GEBCO bathymetry. Red lines indicate major plate boundaries [Bird, 2003]. Gray circles, if present, are aftershock locations, sized by magnitude. From USGS. Figure 6. 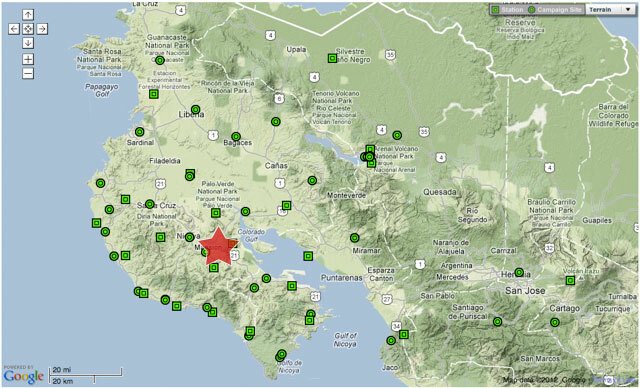 UNAVCO Archive Data availability for continuous (square) and campaign (circle) GPS stations in Costa Rica. 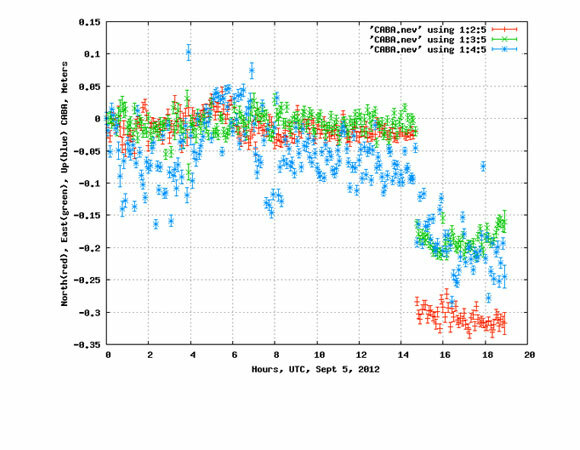 Data holdings from 1996-present are available through the DAI including 5 Hz data recorded during the event. Figure 8. 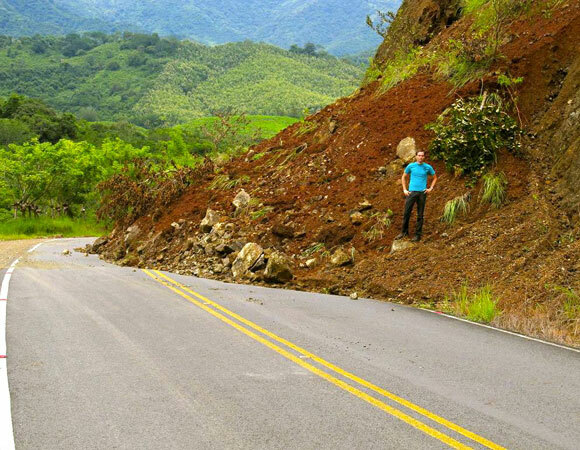 University of South Florida graduate student examines a landslide near the epicenter of the September 5, 2012, earthquake on the Nicoya Peninsula of Costa Rica. Figure 9. 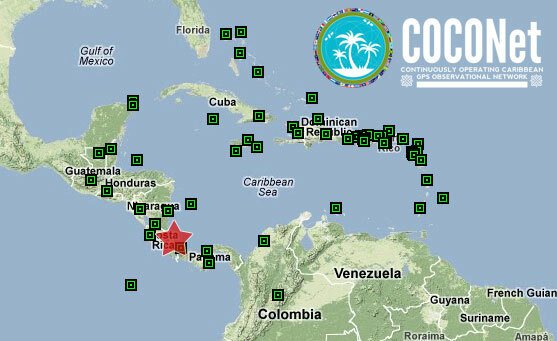 The HOJA campaign GPS station in Costa Rica. 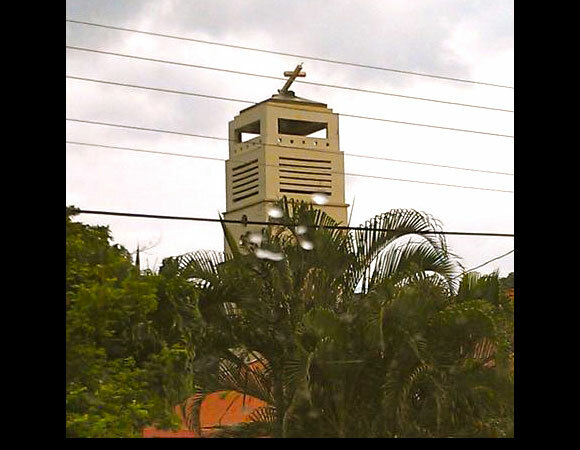 Located next to the town of Hojancha, HOJA is 8 km SW of the epicenter. Figure 10. 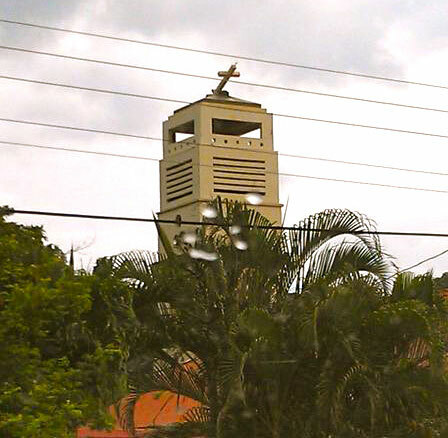 A damaged church in Camas, 10 km SE of the epicenter of the September 5, 2012, earthquake on the Nicoya Peninsula of Costa Rica. 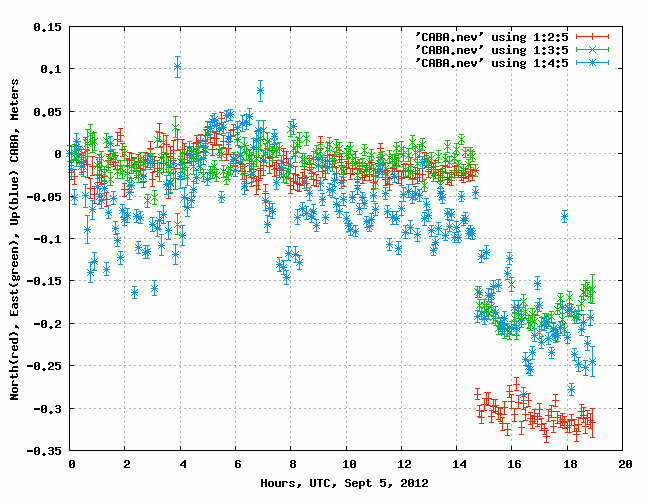 Links to raw data from the UNAVCO Archive and processed results from community scientists will be posted in the forums. 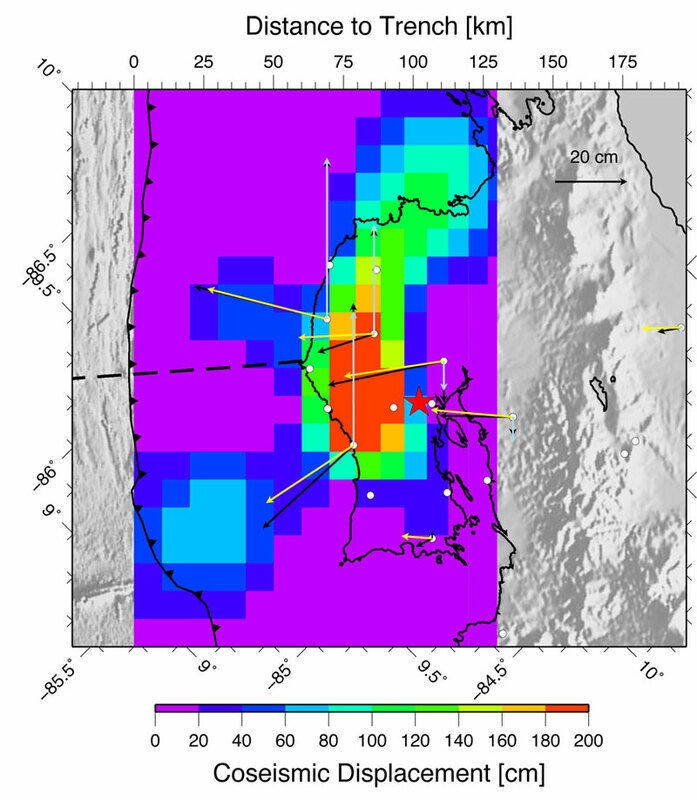 The fact that the 2012 earthquake occurred essentially in the middle of our observation networks provides an incredible research opportunity. 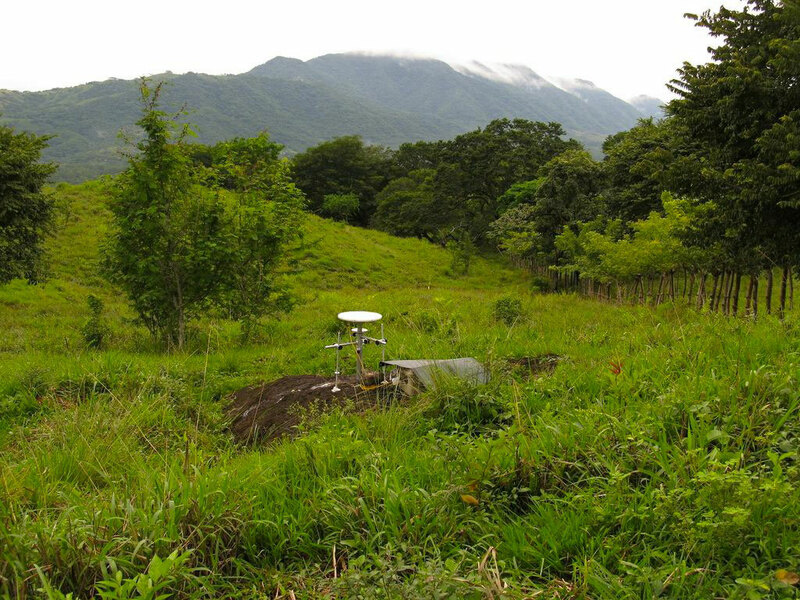 Data from the various Nicoya networks will give an unprecedented image of the spatial extent and magnitude of the 2012 rupture, and the extent, magnitude and time variation of post-seismic processes. In addition, southwest motion of the fore-arc crust relative to the volcanic arc could unload northwest-striking vertical strike slip faults that accommodate motion of the fore-arc relative to the volcanic arc, stimulating subsequent seismic activity on these shallow crustal faults. Such events could actually be more damaging than the September 5 event, given their proximity to urban areas. Also, since it has been a long time since a major earthquake struck the region, it is possible that seismic shaking and crustal motion will stimulate volcanic activity in the nearby volcanic arc. 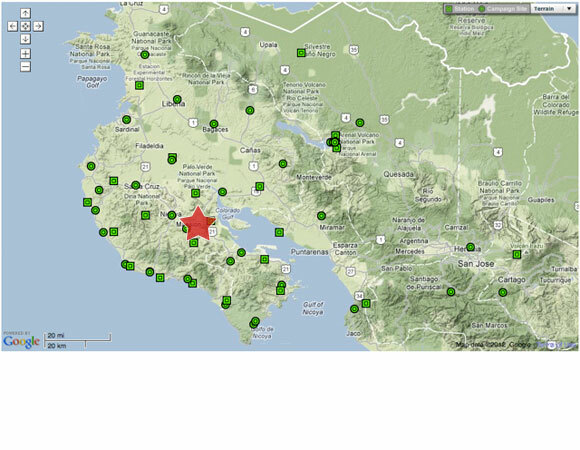 Volcan Arenal and Rincon de la Vieja are closest to the earthquake’s epicenter, but Poas and Turrialba also bear watching. Turrialba’s fumarolic activity has been increasing since 2001, but this volcano has not experienced a major eruption since 1866, implying the possibility of significant volumes of stored magma. 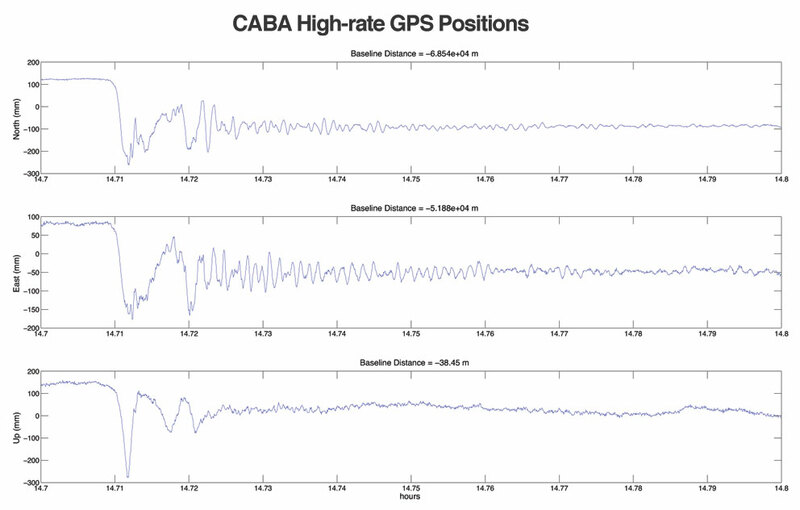 Detailed information on available GPS, strainmeter, and satellite data acquisitions will be posted in the forums. Field-ready campaign GPS systems are available for deployment if requested. Please visit the Community Geophysical Event Response Coordination page to request support from UNAVCO.